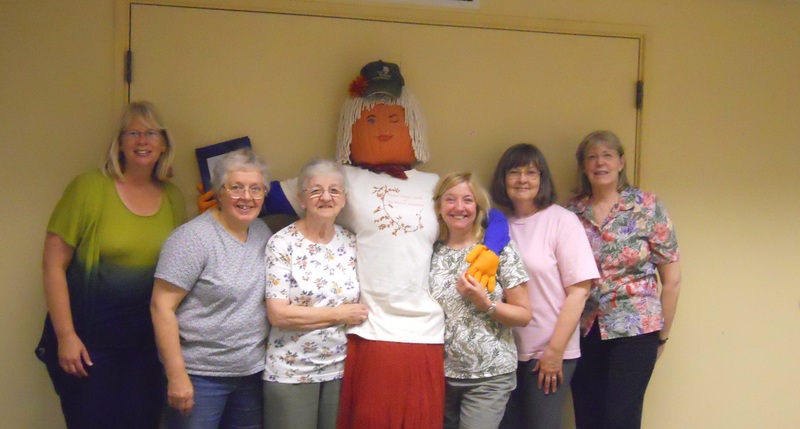 Betty Birdwatcher Needs Your Help! This year’s annual Nature Artists’ Guild contribution to the “Scarecrow Trail” at The Morton Arboretum is almost ready for her debut. Betty Birdwatcher will be sporting a spiffy Nature Artists’ Guild t-shirt, a lovely skirt, and her bandanna and hat will be a great help in protecting her from the sun. Betty’s bird-watching field guide is in her hand, so all she needs now is an old pair of broken binoculars (or an inexpensive pair of toy ones) and a large bird to keep her company as she sets out to spot and sketch the many birds of The Morton Arboretum. If you can help her out with either of those items, please contact Suzanne Wegener, our Arboretum liaison, whose information you can find in your Yearbook. You could also leave us a message by commenting on this post. Betty can be found in the “Scarecrow Trail” along Meadow Lake at The Morton Arboretum throughout the month of October .